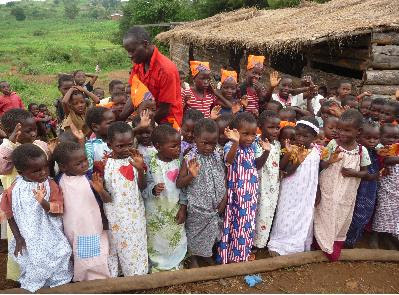 A few weeks ago, a woman at my church announced she wanted us to make little pillowcase dresses to send to Africa. I sew, so that week I took an afternoon and made my first little dress. I decided to do a size three since Kaitlyn is three. As I sewed it, I was so struck by the fact that this little dress would likely be the only dress a little girl in Africa would own. I imagined how much she would treasure it. I had the overwhelming desire to help more. I can’t really explain how I felt except that the urge to do something more pretty much consumed me. The idea came to me that I should turn to you readers! So this week, instead of doing a giveaway for ourselves, let’s do a giveaway for little girls in Africa! Hopefully this will go well. If so, I will choose something every so often for us to donate to. I know we Babywise moms are moms who are concerned with morals and ethics–we love others. We believe others are of value. I thought this would be an opportunity to teach service by example to our children. We can involve them in choosing the pillowcase or fabric to make the dress. Some might be old enough to help make the dress. Please know I don’t want to guilt you into anything at all; I won’t think anyone is horrible if they don’t do this. I have this ability to speak to thousands of people and thought it would be a great way to spread the word! 1. Through Me: My church group is gathering dresses until July 1, then we will be sending them off. If you would like to make a dress, you can make it and send it to me. I will add it to our pile. If you can’t make one but want to help, you can send supplies for the dress. Depending on how many supplies I get, I will either make them or gather up a bunch of ladies to help make them. You can also send money if you want and I will buy supplies to make a bunch of dresses. 2. Through LittleDressesforAfrica.org: If you don’t want to send stuff to me, you can send it to this group. This is a Christian, non-profit group. They have distributed dresses to 10 different countries in Africa! You can donate money through this website. You can also send dresses to the address listed here. They also have a list of 10 ways you can help. Even if it you contribute just one dress, it will make a difference. I have a story to illustrate this. I have heard this story many times. I searched for it, but can’t find it. So here it is in my words. One day, a man was walking along the beach. The beach was covered with hundreds of [clams or oysters…I don’t know]. Because the tide had gone back down, these [clams or oysters] would soon die. The man saw another man walking along the beach. As he walked, he picked up the [clams or oysters] one by one and threw them back into the ocean. The first man stopped the second man and asked him why he was even bothering with that. He told him to look around; there were hundreds of [clams/oysters]! He couldn’t possibly make a difference. The second man simply bent down, picked up another clam or oyster, and threw it back into the ocean. “It made a difference to that one,” he replied. The message of this story is that every little bit helped. You might not be able to change the entire world, but you can change the world for one girl. And to her, it makes a difference. If you would like to make a dress yourself, you can follow the instructions on this page. I decided to write my own tutorial using the instructions from Nancy’s Notions on how to make the dress that is FULL of photos and hopefully very easy to follow. That is found on my craft blog: valscreations.blogspot.com. So this is my challenge to us! Let’s make some dresses for Africa. I promise making a dress is simple and quite fast. It took me about 2-3 hours–but that was in conjunction with taking care of my three children and taking photos of every step so I could write the tutorial. Donate using either method I described above. If you want to send something to me, please email me at [email protected] and I will give you the info to do that. Whether you donate by sending it to me or to http://littledressesforafrica.org/, please leave a comment here saying you did so! I would love to hear and see the difference we all made collectively! If you want to send photos of the dress/dresses you made, email them to [email protected] and I will do a post with photos of all of our dresses in early July. Again, this is not me trying to guilt anyone into doing anything. If this is something you want to do, please do! Here is a photo of my first little dress. Don’t you think a little girl somewhere will love this?!?! Love the story illustration, even if it was starfish instead of oysters 🙂 This sounds like a great project, I'm going to chat with some of the women at our church and see if we can't contribute. We have several women who are fantastic sewers (or whatever you call people who sew, lol!) If it's just me sewing a few I'll contact you and send it to you in mid-June so it's there in plenty of time. I am sooo going to do this! Thanks for posting….will try to get other seamstresses I know, involved. Love this idea! I'm getting my grandmother's sewing machine soon, so even my novice sewing skills should be able to handle it. This post really touched my heart and made me want to jump right in and start sewing today….which is exactly what I did! After a trip to the fabric store, I have materials to make 7 dresses and have already finished 2. I want to thank you so much for sharing this amazing opportunity!! Hi Val! This is an amazing thing you are doing, giving back. I'm a babywise mom of identical twin girls. They are 20 months now and I found babywise and your group invaluable tools in the beginning. Now my friend just had twins and I found myself back here again. In the process I stumbled across this post. I wondered if, when you are choosing a charity, you would ever consider Preemie Prints. We benefit NICU families who have premature or sick little ones. We give gift bags to families and have support group and offer complimentary photography. You can learn more at our website http://www.preemieprints.org or facebook page http://www.facebook.com/PreemiePrints Thank you for considering sewing for preemies! God bless and thank you for all that you do. Thanks for telling me about that AJoy! I will check that out for sure.